Cruises are for families and fun-lovers of all ages. "Fun Ships" offer great value for money. The world's largest cruise line -- big ships with panache. What is Carnival Cruise Line? Founded in 1972 by Ted Arison and currently owned by Carnival Corp., Carnival Cruise Line is one of the largest cruise lines in the world. Carnival ships are some of the most instantly recognizable, thanks to their iconic red, white and blue "whale tale" funnels. How many ships does Carnival Cruise Line have? As of 2018, Carnival Cruise Line has a fleet of 26 cruise ships, with two more under construction and due for launch in 2019 and 2020, respectively. Another ship is scheduled to launch in 2022. Where do Carnival cruise ships leave from? 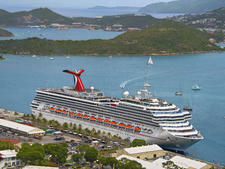 Most of Carnival's cruise ships sail from ports in the United States or Puerto Rico. Year-round, ships depart from Fort Lauderdale, Jacksonville, Miami, Tampa, Los Angeles, New Orleans, Galveston, Baltimore, Mobile and San Juan. Seasonally, Carnival cruise ships depart from San Diego, Charleston, New York City, Seattle, Vancouver, Norfolk, Honolulu, Barbados and Barcelona. One Carnival ship -- Carnival Spirit -- sails only in Australia and cannot be booked in the United States unless you use an Australian-based travel agent. 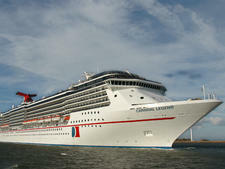 A second ship -- Carnival Legend -- spends half the year sailing in Alaska and half the year in Australia. Where do Carnival cruise ships sail to? Carnival ships sail primarily to the Caribbean, Bermuda, Mexico and the Bahamas, but you can also cruise to Alaska, Cuba, Hawaii, and Canada & New England. 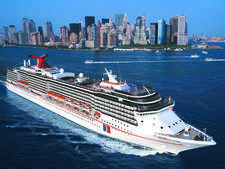 Carnival Cruise Line also offers limited Mediterranean sailings, as well as Panama Canal transits and transpacific crossings from Honolulu to Sydney (or vice versa). Are Carnival cruise ships very different from each other? Carnival cruise ships can range in size from 2,700 people at full occupancy to 5,100, but because the line has invested heavily in regular updates, most ships feature the same standard -- and popular -- dining venues and bars. Spots like Guy's Burger Joint, BlueIguana Cantina, RedFrog Rum Bar and BlueIguana Tequila Bar are on all ships, except Carnival Miracle and Carnival Splendor. When it comes to entertainment, all Carnival ships have a comedy club for family-friendly evening and adult-only night shows, as well as a main theater where you'll find 35- to 40-minute high-energy song-and-dance shows. Where the ships tend to differ is with specialty (extra-fee) restaurants. For instance, only 16 ships have a steakhouse, eight have a sushi place, five have an Italian trattoria and three have a pan-Asian restaurant. Who goes on Carnival cruise ships? Carnival Cruise Line sells itself as the "fun" cruise line, and it attracts cruisers who are looking to have a good time with little to no pretensions. Carnival cruisers, who range from young to old, tend to be quite friendly, looking to strike up conversations with other people in the buffet, by the pool and, really, anywhere. Carnival is also one of the most family-oriented lines in the industry, and you're bound to see lots of kids onboard, even during the school year. When school is out, you can expect the number of kids to be well into the hundreds. The line is also popular for family reunions, and bachelor and bachelorette parties. People on Carnival cruise ships hail primarily from the United States, mainly the south and Midwest, but you'll also meet folks from Canada, England and usually a handful of other European countries. Do I have to dress up on a Carnival cruise? Carnival cruises are casual, with shorts, tee shirts, capris, swimsuits or swim cover-ups de rigueur during the day (no bathing suites in the dining venues, however). Most nights the dress code remains much the same, minus the swimwear, though technically the cruise line asks that people not wear shorts into the main dining room. The policy is inconsistently upheld. On "elegant" nights, you'll see a range of clothing from ball gowns, dresses that leave little to the imagination, tuxes and suits to the same shorts and tees people sport all day long. Most men, however, opt for long pants and collared shirts, while women don sundresses, or a skirt or pants with a blouse. Men are not required to wear a suit jacket or tie in any venue. What are Carnival's most popular activities? Aside from the main pool, which is the hub of much of the line's fun activities, almost every Carnival cruise ship also has at least one waterslide, with several having multi-slide water parks. Additionally, several have a top-deck SportSquare that features a colorful collection of outdoor amusements, including Ping-Pong, billiards, foosball, mini-golf, Twister and a SkyCourse ropes course. On the line's newest ships (Vista and Horizon), there's also the SkyRide, a recumbent bike attraction suspended 150 feet up in the air, requiring riders to pedal their way around an 800-foot track that wraps around the outer decks. Inside, you'll find activities that range from trivia and Bingo during the day to comedy shows and high-tech song-and-dance revues at night. Carnival ships also have lively bar nightlife, especially on ships with a RedFrog Pub; there's also an always-busy casino. Is everything free on Carnival Cruise Line? No. While Carnival is one of the more inclusive cruise lines when it comes to dining, you will still have to pay extra for some specialty dining, all drinks (alcoholic and non, except water, select juice at breakfast, and coffee and tea), shore excursions, visits to the spa and any retail purchases, including photos. 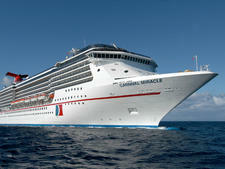 Carnival specializes in fun, laid-back, family-friendly cruises. Carnival cruisers hail mainly from the United States, and vary in age from young to old. 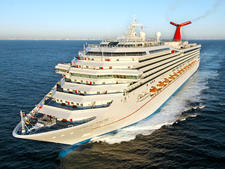 Carnival Cruise Line has a fleet of 26 cruise ships.